The Spending voted for by each Member of Congress and the National Debt are being scrutinized by 2010 OR BU$T, a nonpartisan public information organization. Its website, VoteBigSpendersOut.com, keeps a running tab on the spending of Members of Congress starting January 2009. 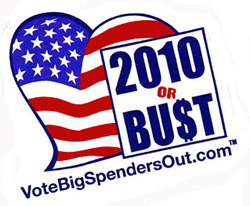 The nonpartisan organization, 2010 OR BU$T, has launched a public information website at VoteBigSpendersOut.com. As an impartial, grassroots group whose views remain neutral, their site focuses only on statistics surrounding our national debt and the spending each Member of Congress voted for. The comprehensive resource-site provides information to help individuals decide for themselves how best to vote in the upcoming midterm federal elections. The information is compiled in clear and concise “Spender Tables” that show spending in excess of revenue in Congressional bills which include $90 million or more. The tables list net spending for each Member of Congress in both the House and the Senate during 2009, year-to-date 2010 and a combination of the 2 years. Spending is presented alphabetically, by state and by spender rank. The overall goal is to create a more informed public and give the people as many resources as possible. Along with the comprehensive Spender Tables, their website also provides additional links and information concerning the national debt and government spending topics.